What a lovely month March has been! The weather is getting nicer, flowers are everywhere and spring is finally here! I don't know about you, but whenever the seasons change I just can't wait to go shopping to get my hands on some new items. I've had to be very strict with myself though, as I've been saving my money for our trip to Japan. But, I couldn't control myself when I went into Tory Burch a few weeks ago, and got this lovely pair of Reva patent leather flats in the color Sand. I originally had my eye on the Caroline ballet flats, but they didn't really blow my hair back when I saw it in person. This has been my favorite pair of shoes for March! I found myself reaching for my DKNY Be Delicious perfume almost everyday, because it reminds me of summer, and obviously, I'm a big fan of the sunny seasons. Also, now that the sun is out more often, I've been wearing my Ray-Ban Wayfarers all the time. This month, I've been loving Yankee Candle's Farmer's Market. The Boyfriend got me the biggest candle they make, and it has lasted me more than a month and a half, even though I burn it every night. Definitely getting that size again. But which one should I try next? I've been wearing Essie's Peach Dacquiri on my nails for more than half of March, so obviously it has been my favorite nail polish. So those are my favorites for the month of March. What has been your favorites? Be Delicious has been one of my favorites for years! I wish I could afford Tory Burch! I can imagine. It's probably already humid as hell there? Taiwan will probably have spring for a few weeks and then the humidity and heat will be here, too! Guess I will write mine today as well! I like the new shoes you got! I have been aiming for Eddie Ballet, the back is more comfortable, bought one pair of that design from TB before, you might also like it! Thanks, I really like the color; goes with everything. I like the Eddie ballet flats as well, and I can imagine the back is more comfortable. Look out for my Japan Photo Diary next week! Love the Essie color! And the ballet flats too. I know the feeling of saving up for a trip, I'm saving up for a trip this summer as well! My favorite candles from Yankee are Storm Watch and Vanilla Cupcake. I love everything! 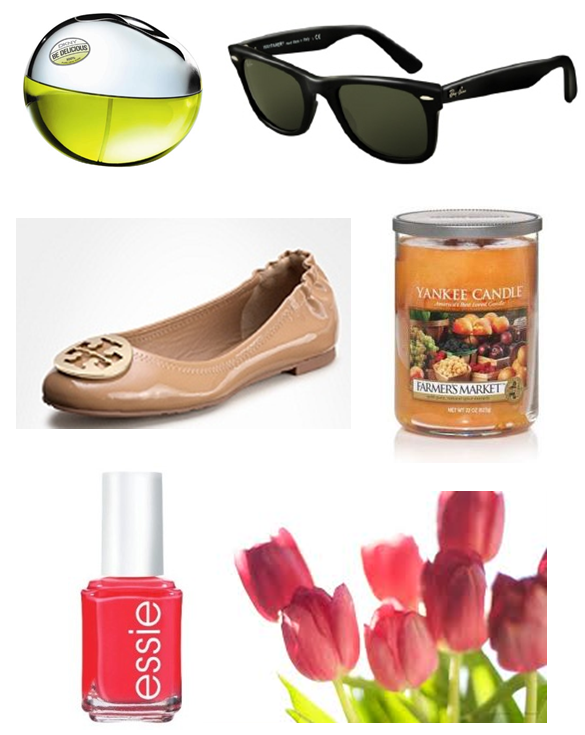 Especially the sunglasses and the Essie nail polish! Such a beautiful color!